Each year, the Bayreuth International Summer School (BISS) brings students from all over the world to the lovely town of Bayreuth. Taught by both German and international lecturers, the courses in the fields of applied sciences, international law, economics, and more will broaden your knowledge. 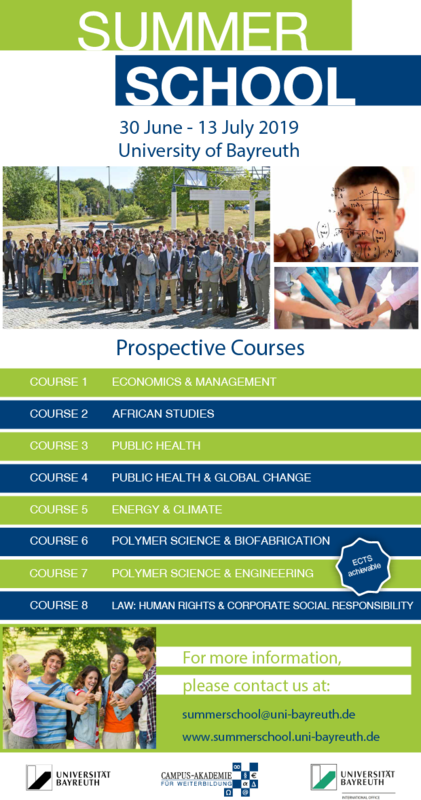 The Summer School enables you to profit from an interdisciplinary approach, exhilarating discussions as well as practical units, e.g. lab courses and workshops. BISS generally encompasses a two week course programme, interesting activities, an excursion to either Berlin or Munich, a welcome and farewell dinner and an unforgettable time in Bavaria. The organization is taken over by the Campus-Akademie in cooperation with the International Office. This year, the Bayreuth International Summer School takes place from 30 June to 13 July 2019 and offers eight courses with renowned national and international lecturers. From 15 January to 30 April 2019. Fore detailed information, please click here. Please note that accomodation fees are not included in the rate. You can find more information about hotels here. Our team is happy to assist you with any questions related to our Summer School.